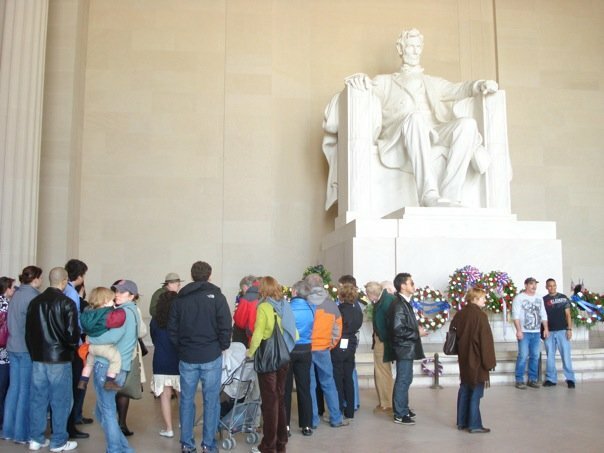 What’s Wrong With The Gettysburg Address? 152 years ago this afternoon, President Lincoln delivered one of his most famous speeches. At the time, it was considered a flop (or “The Flop That Popped” in the words of Salvador Litvak), but today we treat it like the gold standard of Presidential communication. Follow along for more Lincoln fun at @HonestAbeBlog! Labor Day didn’t exist as such during Abraham Lincoln’s lifetime. Although, it originated in a late nineteenth century tradition of showing public support for labor issues, it was not until 1882 that it became a more organized celebration. 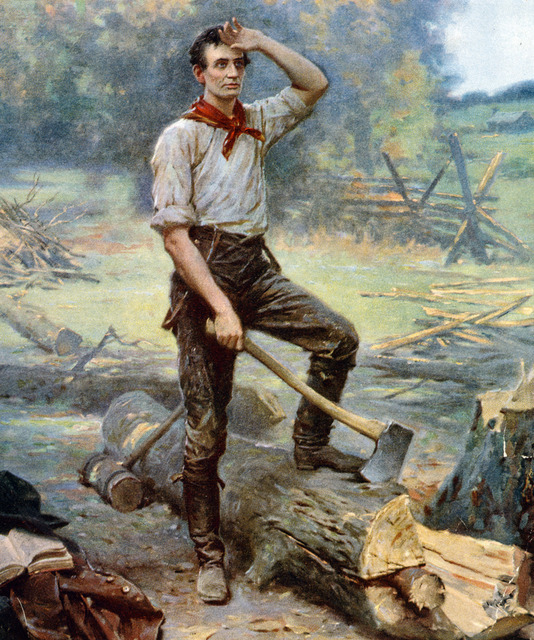 He was no wimp when it came to hard labor, himself; indeed, the classic image of Lincoln the rail splitter comes to mind. Although for most of us, today is a day where we take a break (or in my instance – spend 12 hours travelling home from a vacation), it’s important to step back and take a minute to be thankful for all of the hard working people that makes our country great. Earlier today I was listening to the Songs to Sing in the Car Spotify Playlist when Hozier’s haunting ballad of the year, “Take Me To Church,” came on. In a bizarre Pavlovian moment, my eyes welled up with tears and my heart felt like it hit a brick wall. You see, the last time I had really listened to that song was on June 18th of this year as tears streamed down my face in the public bathroom of a swanky hotel in Richmond, Virginia; an unplanned destination on a family trip through the South after we all agreed that leaving Charleston would be the best course of action. Since reading Midnight In The Garden of Good and Evil as a pre-teen, I’ve felt a magnetic draw to Savannah, Georgia. It’s the first “adult” book that I remember reading, and discussing, with my dad; and one of the first book-to-movie adaptations I experienced where I read the book first. 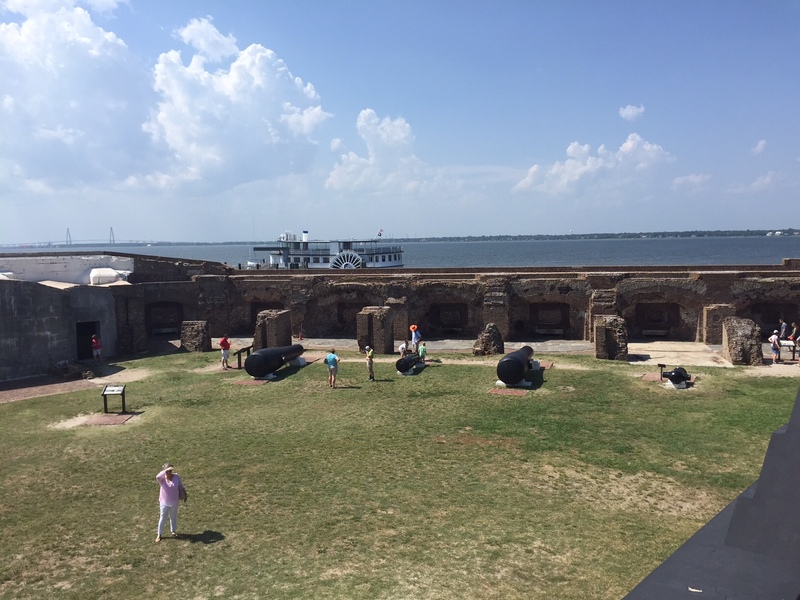 With this deep, but unconsummated connection lingering, Savannah, and the South in general, seemed an obvious, and perhaps beautiful, choice for a family vacation. Beyond making jokes about it being a sort of reverse Sherman’s March before the trip, I did not expect to find my passion for history matched by my surroundings. In truth, I had not fully realized how present the Civil War was in everything from the landscape to the conversation. 150 years feels like a long time to us today, but in the grand scheme of cultural evolutions, it’s merely a flash in the pan. 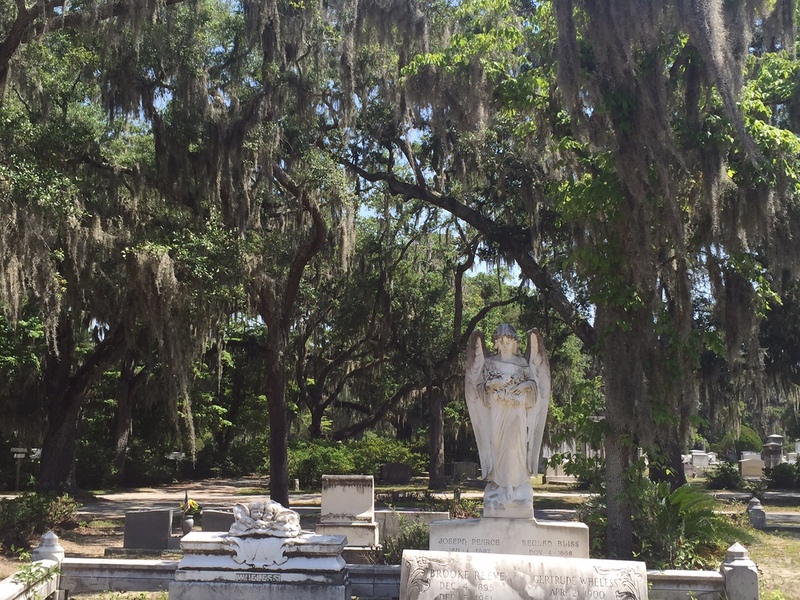 We kept our itinerary loose, knowing that we wanted to go to Savannah, see the Mercer-Williams house and Forsyth Cemetery, but I began pushing hard for a stopover in Charleston, the start of it all. And after not all too much work, I prevailed. Upon leaving Savannah, we piled into my parent’s car and headed northeast to Charleston. We arrived at the National Park Boarding Station 5 minutes before the last boat of the day would head over to the Fort. We rushed through the ticket line and loped onto the ferry which would bring us to the island. The ride lasted about 45 minutes and built an ominous mood around the voyage. Upon arrival, I was struck by how barren it was. Living in Washington, I guess I’ve formulated an assumption that National Parks will always be lush; a memory frozen in time as the rest of world grows around it. 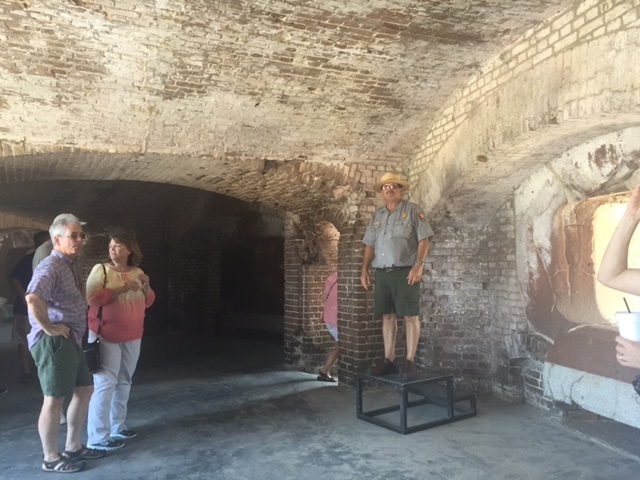 Fort Sumter was different. Time, and quite likely war, had worn its walls. It did not feel like living history, and yet the legacy of what it meant and what it stood for, felt very present. After listening to the Park Ranger tell his story, we had some time to rove free across the island, into the gift shop, and a small accompanying exhibit. It was in the exhibit – which had the added benefit of air-conditioning on a scorching day – that things began to crystallize in my mind. As I stared at those quotes, I was already formulating a blog post that I wanted to write. I wanted to talk about the ways this event, this strange and heartbreaking moment in history, over 150 years ago, still shaped the experience of Americans today. I wanted to talk about Trayvon Martin, I wanted to talk about Freddie Gray, I wanted to say that #BlackLivesMatter and that on April 12, 1861 a behemoth that we still grapple with today was set in motion. Already in that mindset; I could not have predicted or anticipated the horror that would beset Charleston a mere four hours later. I feel bad now that I was in a crappy mood. I was hungry and a little petulant as my parents and I walked down King Street to Old Towne Grill and Seafood, the first result that showed up in my Yelp search. When I think back on it now, so many things feel weird about that day. The sign that said “Remember the Charleston Nine” as we drove into town (it was referencing the horrific Charleston Sofa Super Store fire of June 18, 2007 which claimed the lives of nine firefighters), the creepy not-on-the-beach beach house rental, the fact that we just barely made it to Fort Sumter. After dinner I was exhausted; and went to bed. At first just to read, but then to hopefully sleep, at 8:45pm. I woke up at 11pm; my father had nodded off while watching the local news which was already filled with reports of the attack. We weren’t that far away from Emanuel African Methodist Episcopal Church that night. We had driven by it at least twice earlier in the day. We weren’t there, and the fact of the matter is, if by some strange incident we had been there, the color of our skin could very well have saved us. All night, the sounds of helicopters and sirens permeated the air. As information, and confirmations, were released and announced on the television, I could feel myself numbing to it all. I went back into the bedroom, but laid awake, staring at the ceiling until I saw the first sunbeams of morning. None of us slept very much, or at all, that evening; and we hit the road driving north much earlier than anticipated the next day. Arriving in Richmond with hours of contemplation weighing heavy on our minds, we stopped at the hotel bar for a drink. When I used to hear the word terrorism, I conjured up images of earth shattering fear: Hiding under desks, conventional or modern warfare. And that’s it, to me the word “terrorism” used to feel like an act of war; an act designed to stimulate the actions and reactions between clear opponents. But when those 9 incredible people lost their lives in a brutal terrorist attack; it wasn’t so clear-cut. That horrible act was perpetrated by someone who sought to misappropriate and define divisions. But the truth about terror, is that it is not inherently an act of war, it is an act of violence. And violence begets a slew of societal problems, not the least of which is a deep sadness. But out of sadness, we can grow. Human beings are complicated creatures; but we’re capable, we’re social, and most importantly we’re resilient. The moral of all of this? History isn’t just a part of our past. It’s a part of our today, and it shapes so much of our world. This isn’t such a revolutionary idea, but it makes a difference. When we see an act of terrorism through the lens of an ongoing struggle, it can feel disheartening, it can feel like an insurmountable challenge. But this focus, this attention, the work of the thousands of people who seek to embrace the notion that a little bit of kindness can make the world a better place, they’re making a difference. Getting this out helps. It helps to state your purpose; and my purpose here is to use the framework of history to gather a better understanding of the world around us. It’s not that we are stuck in the balance of good and evil, it’s that we’re forging a path forward that leans more towards good. And that’s what matters. What kind of gift do you give to a friend who is turning 204? Well, a blog post seems like a good enough present to me! A lot of people ask me why Abraham Lincoln? Sometimes I come up with a quippy answer (“Because he’s such a babe!” or “He keeps me honest!” or “I’m just a nerd-girl!”) but in truth it’s deeper than that. Lincoln wasn’t a perfect figure, and hagiography is never a good idea, but I think it’s important to recognize when a figure touches on so many facets of culture. It’s in the cultural connections we make as a society that we most clearly discover who we are – and in turn discover how we can improve. Lincoln has been appropriated (and maybe even misappropriated) by many different people representing many different opinions – but maybe if we look critically at his use – we’ll be able to find that middle ground that so many out there are seeking. It was exactly that spirit of compromise with a guiding light that Lincoln brought to the position of Presidency – and so I think that’s what we should focus on as we celebrate his 204th birthday. So happy birthday old friend – I look forward to your many, many, many returns. Who would he like to play Lincoln? And Booth, the actor turned assassin? Now, I’ll make this pretty clear, I am a Harrison Ford apologist to the extreme – the man can do little wrong in my eyes, but I wonder – would he be a good Lincoln? I guess this gets down to the meat and potatos of a question that I’ve been pondering for some time: what does it take to portray Abraham Lincoln successfully? I’ll have to mull this over a bit more… but it does bring up an interesting line of inquiry. 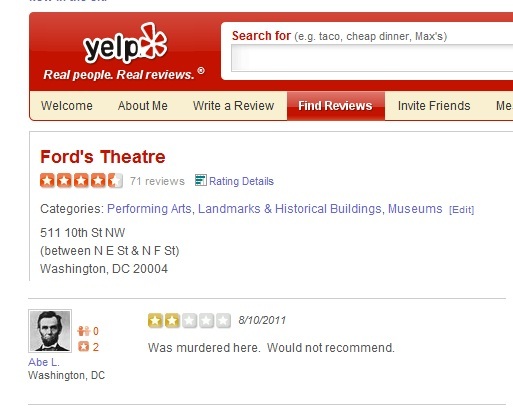 I Wonder What Else Lincoln Has Rated on Yelp? Well, this summer I completed my master’s degree and now that I have settled into this life of freedom I intend on returning whole-heartedly to the world of President Lincoln. I just finished Doris Kearns Goodwin’s Team of Rivals two weeks ago (first post-grad school read!) 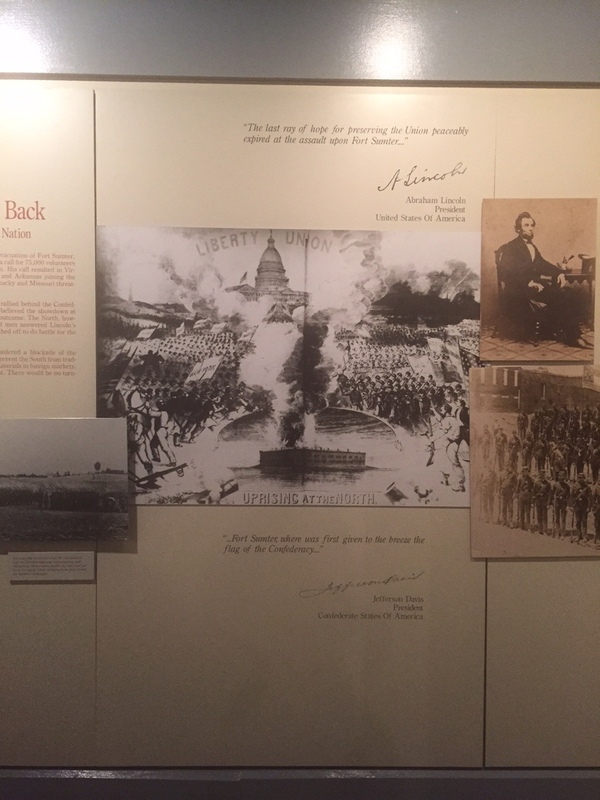 and I expect I’ll include some commentary on the book here soon… but in the meantime here is President Lincoln’s review of Ford’s Theater.